It is now easier than ever to capture and measure the digital customer experience. With the Qualtrics + Adobe Launch integration, users can quickly create and deploy feedback intercepts across all of your digital properties. Qualtrics Website Feedback is now available as a configurable extension within the Adobe Launch Catalog. Users can now enable the Launch extension and follow simple steps to configure the Website Feedback project code and deploy it to their web properties. 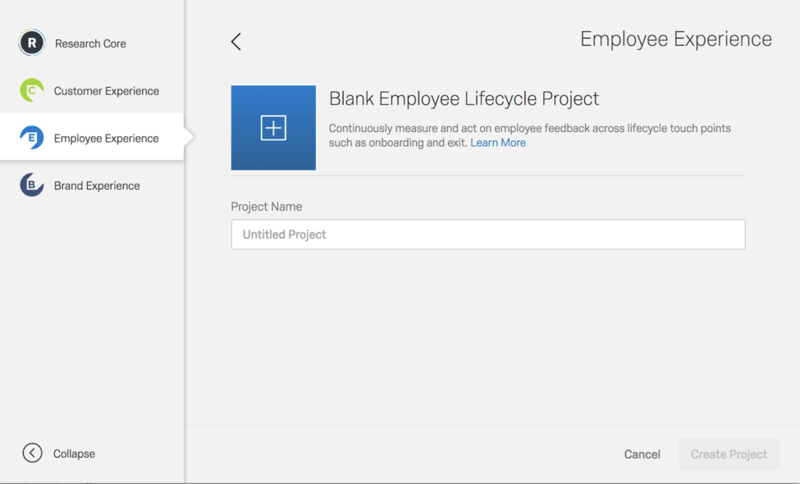 HR teams can now configure their Employee Lifecycle projects to allow participants to submit multiple responses depending on specific criteria. This is particularly useful when there are legitimate reasons for the same participant to submit multiple responses. For example, when an employee takes an Onboarding Lifecycle survey, leaves the company and then rejoins, she should be allowed to take the Onboarding survey again. Users can enable this functionality by going to Survey options and choosing specific metadata criteria that will govern a participant’s ability to submit another response for the Employee Lifecycle project. This feature is only available for Employee Lifecycle projects. Public APIs for programmatically managing surveys. 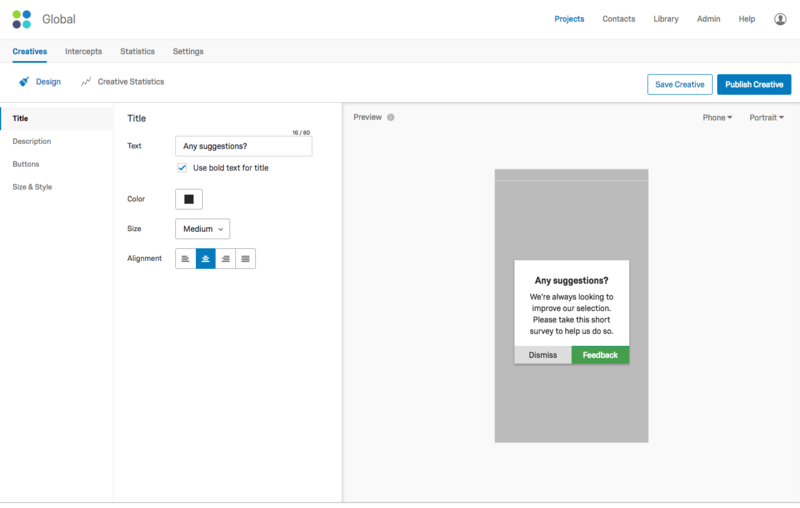 Qualtrics Website and App Feedback users can now take advantage of a new creative (called the Responsive Dialog) that is mobile web optimized and supports accessibility-compliance out of the box. This new creative is most similar to the existing Pop Over and Slider creatives, but adds mobile web responsive support. There is also a new interface for designing this creative that will make it easier for users to build mobile responsive creatives. 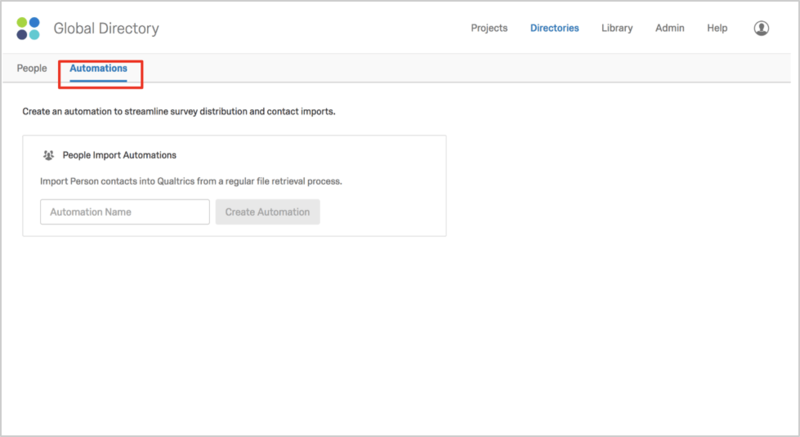 Import Automation users will be able to trigger multiple survey distributions from single file imports based on criteria in the imported records. Users can now use the Qualtrics Mobile App SDKto solicit app feedback via local notifications. Qualtrics has introduced a new Notification creative type specific to mobile apps, and similar to other creatives it can be associated with an intercept that contains targeting rules. With this new creative type, app visitors can be contacted even when the app is not in the foreground (e.g., for app exit surveys). Users who wish to take advantage of the new Notifications feature will need to ensure that they update their app to integrate with version 1.3 of the Qualtrics Mobile SDK (for both iOS and Android). 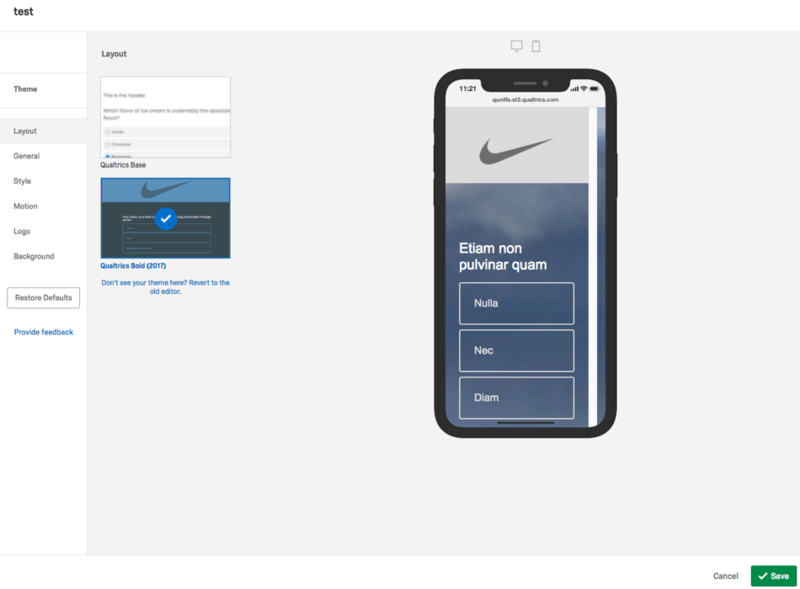 Users can now use the Qualtrics Mobile App SDK to solicit app feedback for apps built with the React Native framework. Users will need to integrate their app with the React Native version of the Qualtrics Mobile App SDK. Full documentation on the React Native SDK is also available. HR teams can now start measuring the employee experience at key lifecycle touch points, such as Onboarding and Exit. They can also benefit from automated triggering for survey invites and automated ingestion of employee lists from 3rd party HRIS systems. Once the end-to-end workflow is configured and automated, teams can focus their energy on the insights surfaced on EX dashboards. 1. Automation to import employee list from 3rd party HRIS. Note: Please be aware that the Unique ID feature will need to be enabled prior to using the People Import automation. 2. New Lifecycle Project type with triggers for events such as onboarding and exit. 3. Certified XM solution content for Onboarding and Exit (pre-configured dashboard, survey, messages). The EX survey editor has been integrated with the XM Platform survey editor so EX programs can now use all of the new XM platform editor features including Survey Publish and Expert Review. 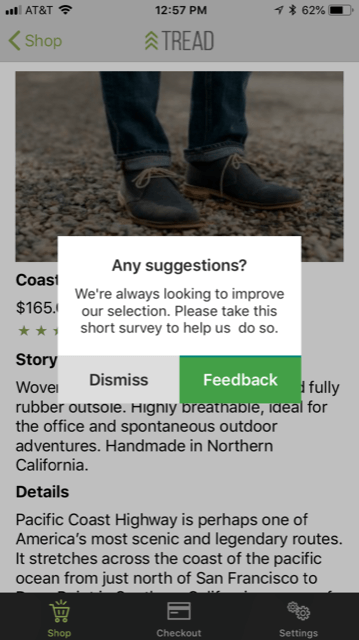 Mobile preview when styling the survey and easy navigation. Ability to add logo and background images. Motion features, including Auto-Advance and Auto-Focus. 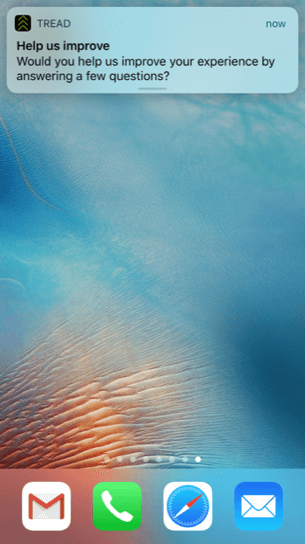 Automatic updates to themes on the latest web design styles and bug fixes. SMS reminders & thank you messages enable clients to send out reminder messages following an SMS distribution and thank you messages following a survey response. Qualtrics will sign emails using a custom DKIM signature per organization to verify for recipients that emails coming from our servers using non-Qualtrics domains haven’t been spoofed, improving email deliverability. This allows users to automatically advance to next question and focus on the question while blurring the other questions on the page. Enables research programs to be streamlined through participant data import and survey distributions automation. ExpertReview, powered by iQ, is like having a Ph.D research methodologist on-staff to personally review every research question and project. It automatically predicts if you’re at risk of poor response rates or low data quality, scores your research project, and offers professional recommendations to improve the research quality. It harnesses the power of data to predict how likely will users drop off, straight line, or become disengaged while taking the survey. 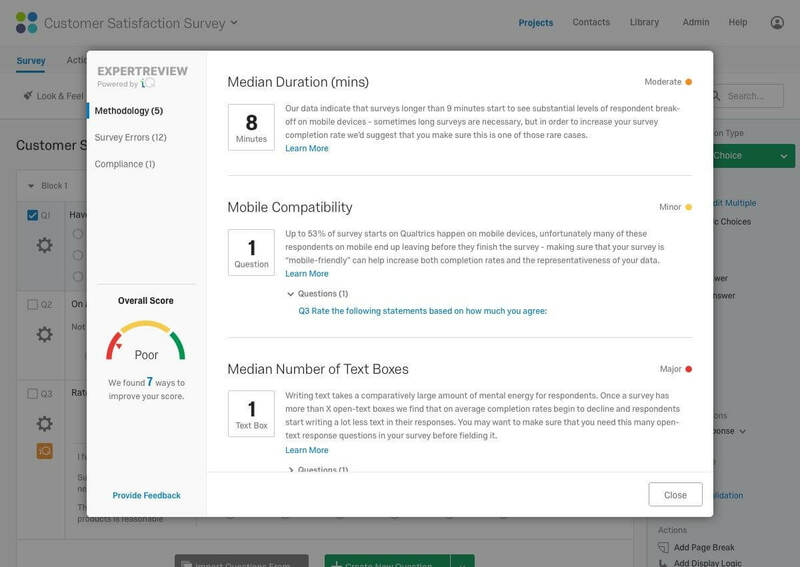 Based on these predictions, it recommends optimizations to your survey. For example, it will recommend the optimal number of text entry questions you should have in your survey or the number of choices you should stay below to ensure high completion rates. It will also flag potential errors such as incorrect logic or incorrect usage of piped text and tell you how to fix it. This avoids costly errors that would have resulted in multiple support calls at best and invalid data at worst. Lastly, it also checks for whether the survey meets certain industry requirements such as WCAG Accessibility compliance. It will recommend changes so you can ensure the survey meets those standards. While acting on those recommendations would help improve the quality of the data, it is designed to be a recommended and not obstruct your regular workflow. You can always choose to ignore recommendations and launch the survey at any point you like. ExpertReview is your digital research assistant that’s available when you need it! You can find additional information on the Qualtrics support site. Survey Versions allow you to save multiple iterations of your survey. You can preview or even restore old versions of your survey at your convenience. Publishing enables greater control over response data quality, as it is now possible for users to control the timing of publishing new versions of a survey. When you publish a survey, it’ll be a little different if your survey is active and open to responses than if it is new. 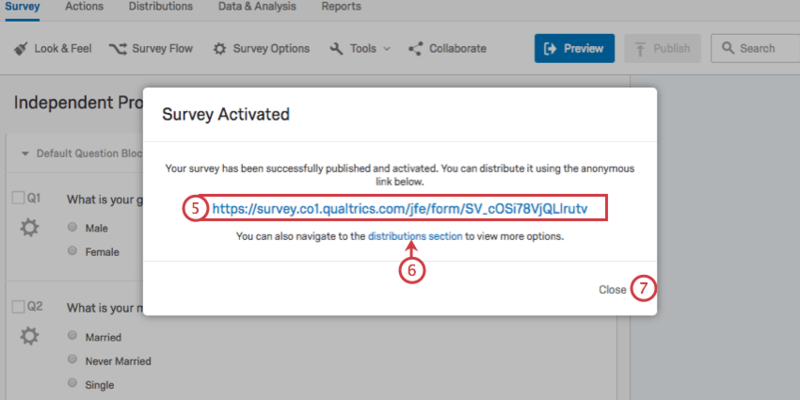 If your survey is new, the first time you publish will also activate a survey. 1. When you are ready to save your changes and present them to your respondents, click Publish. 2. Read the description and note that your survey is about to be activated. This means you will have to press publish after making changes, or else the active survey will look like the last published version. 3. In addition to publishing your survey, you are saving a new version of it. Add a Description of the changes you’ve made. This can be whatever you like. Dates will automatically be stored with the version, so don’t worry about adding date labels. Your survey has now been activated! On this window is the Anonymous Link. Learn more about how this link functions in the linked support page. Sometimes after sending your survey out, you’ll notice you need to fix something, or that there’s some important content you left out. If you edit your survey after it has been distributed, the changes will not go live until you publish the survey. 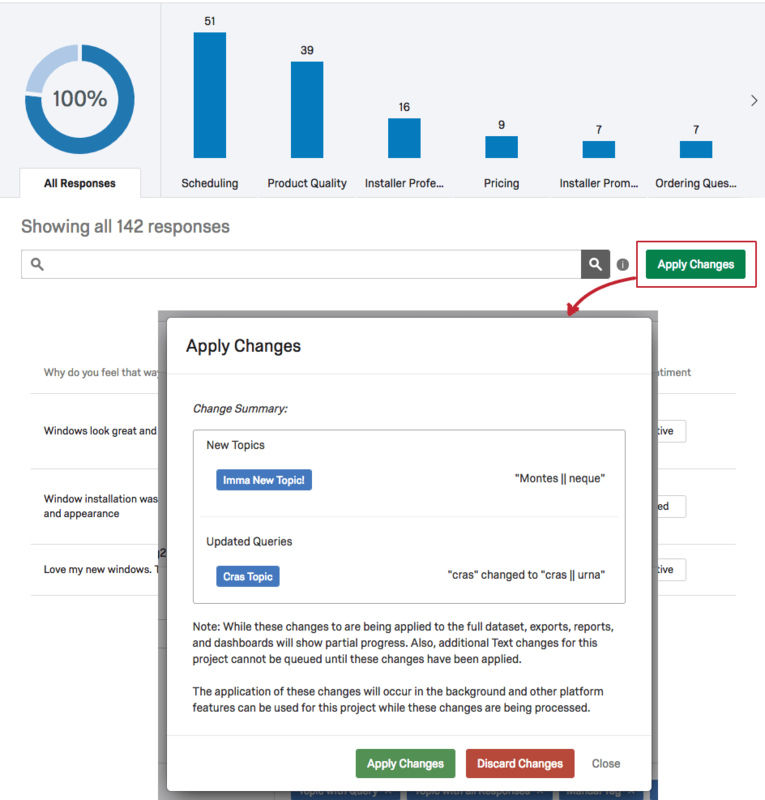 This allows you to carefully review all of your changes before your participants see them. Click the Publish button when you decide that you want the edits you made to be pushed to the active survey. The publication status will appear to inform you which version of the survey you are currently viewing. Here, it says Published. Your changes are always saved automatically in Qualtrics, and they work exactly as explained in the Automatic vs. Manual Saving support page. Publishing just determines when your respondents see your saved changes. 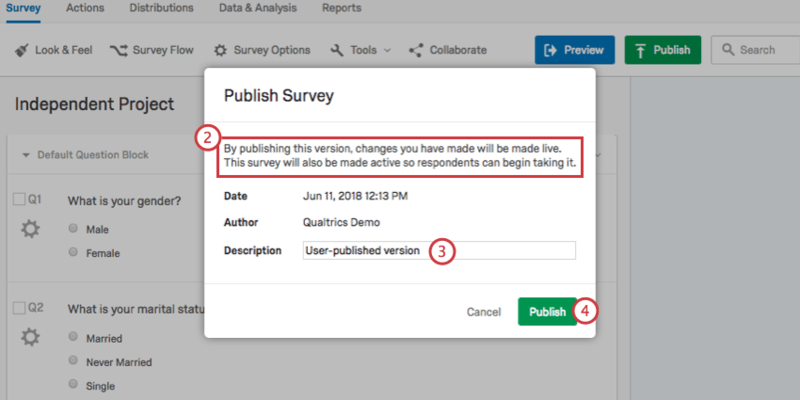 Mobile App Feedback Support for "Survey Has Been Taken"
Qualtrics has added functionality to the Mobile In-app SDK to allow users to show intercepts depending on whether the app visitor has or has not seen a specific survey. With this feature, users can add intercept targeting logic to ensure that an app visitor who has already taken a specific survey will not be shown the survey prompt intercept again. Note: To use this feature, please ensure that you update to using the SDK version 1.2 for Android or iOS. Distribution reporting on CX dashboards will include distributions done via Salesforce. The Qualtrics survey platform is now certified by WebAIM.org, a third-party authority in web accessibility. This is important for any commercial, academic and federal organization whose survey takers may have hearing, vision, motor or cognitive disabilities. Qualtrics is now the only leading survey platform that is WCAG AA certified. Enables Solutions and Conjoint Teams to create questions, surveys logic and experience blocks to build solutions. APIs for enabling conversational interfaces, like messenger bots, to collect feedback using Qualtrics surveys. Qualtrics has released the mobile app SDK, available for iOS and Android platforms, which enables users to quickly and easily build branded customer feedback experiences that originate directly from their own mobile app. Along with the SDK, the intercept authoring portal has also been updated to enable creation of mobile app-specific intercepts. 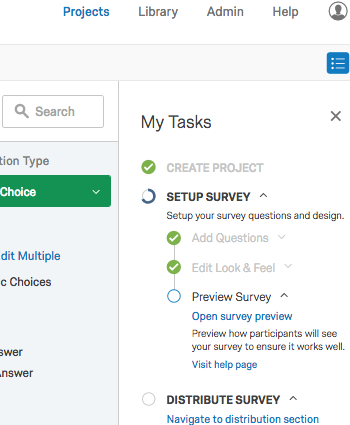 Newly created survey projects will feature a “My Tasks” list to guide users through the steps to complete the project from survey setup through distributions and viewing results. The task list is especially useful for users new to Qualtrics to learn the steps needed to launch a successful survey but is also valuable as a checklist for experienced users to ensure they have not forgotten to do something. System events will automatically mark steps as complete (e.g., activating a survey for distribution will complete the “Distribute Survey” step), and users can also manually mark steps as complete or incomplete. This flexibility gives users the power to ensure the task list always presents a valid snapshot of the current state of their projects. Click here to learn more about how to use this feature. The task list is available for survey projects only at this time. If desired, users can dismiss the task list by hiding it when it is no longer necessary, or reopen it at a later date when it becomes useful again. 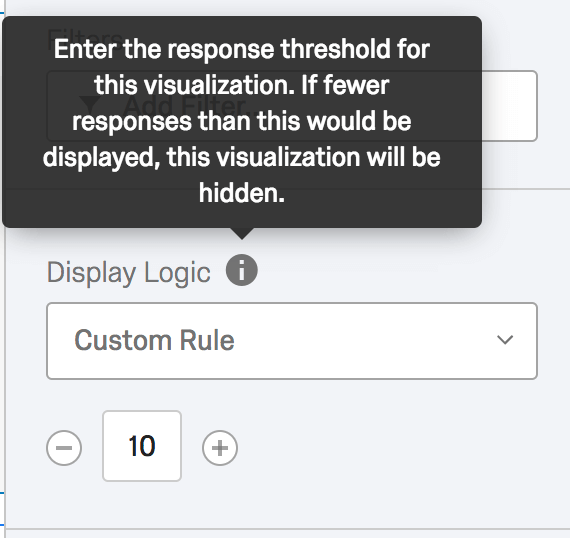 Qualtrics now allows setting thresholds on widgets or at the page level on CX dashboards, to hide data if the number of responses does not meet a minimum value. This is particularly useful to maintain responder privacy when using filters or when looking at team rankings to avoid seeing folks with too few responses to consider a representative score. The threshold can be applied at the page or widget level. 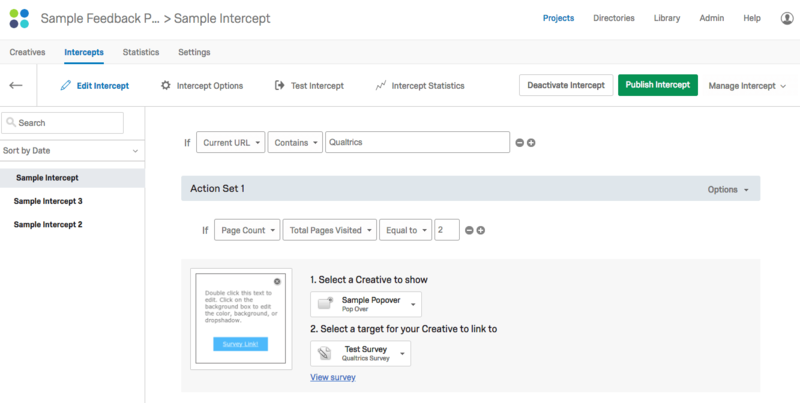 Qualtrics has released a deeper integration of their Website Feedback offering (formerly Site Intercept) with the Experience Management (XM) platform. Digital Managers and Researchers can now create rich, targeted intercepts using the same consistent user interface as that used for authoring surveys, creating dashboards and performing experience data analysis. Additionally, new users will benefit from a first run experience to get up and running with digital intercepts. Note: Existing customers of Site Intercept will be moved to the new UI in a phased manner. Please contact your Client Success representative if you would like to be moved to the new UI sooner. 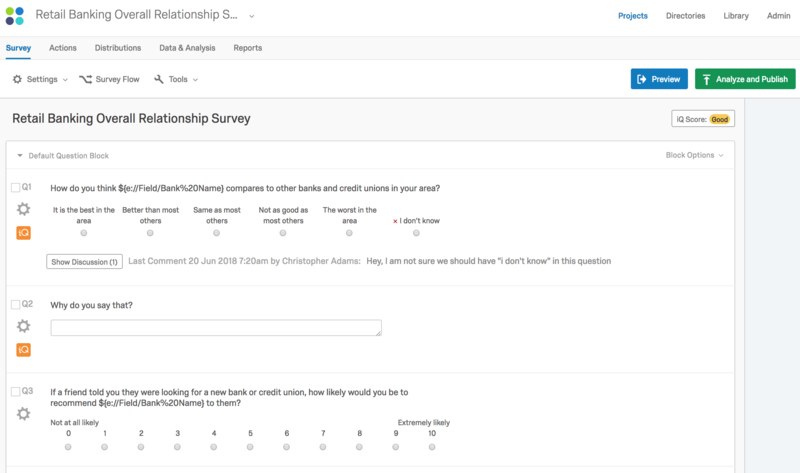 Qualtrics now provides a Collaborate option in the Survey Editor through which users can easily share the survey with any other user or group in their brand. 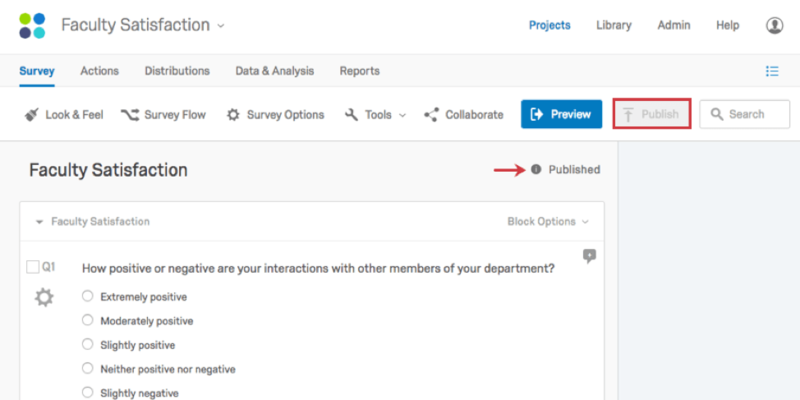 Additionally, if the user wants, she can also share the other modules, such as Distribution, Results, and Contacts with her colleagues through the “Collaborate” option in the Survey Editor. Our studies have shown that our users are already finding this feature extremely useful! They are 77% more likely to collaborate on the survey and ask for feedback from their peers, and 50% more peers are being asked to provide feedback on a survey before it is launched. Responses edited through the Data tool are now available in the single response report. 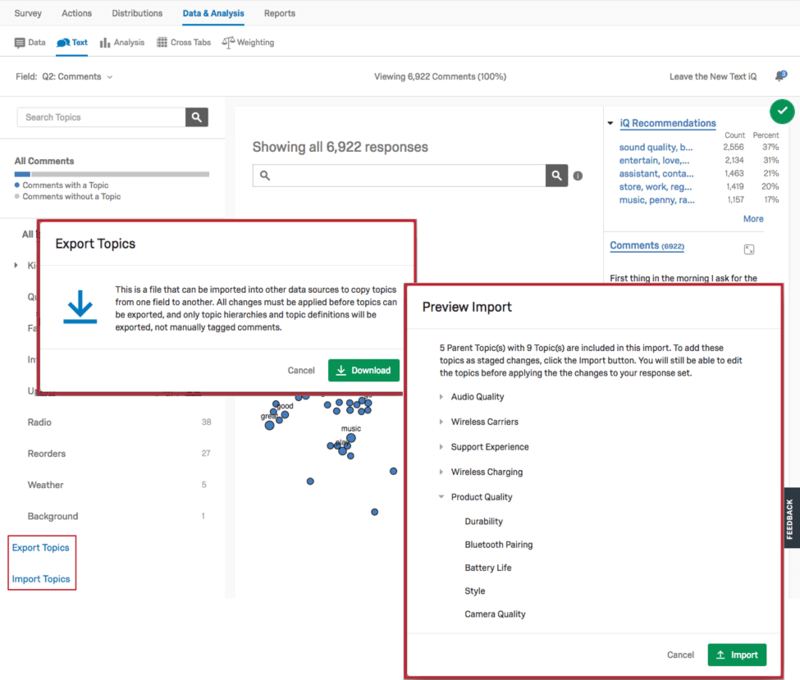 Data that’s edited live in the Qualtrics administrative tools can now be accessed in any single response report. A business can track its online reputation on various online social review sites across its physical or online locations in a CX Dashboard. Qualtrics unveils the next generation of data visualization and insight sharing to all Experience Management users. Editors can control report layouts, tweak individual visualizations, add data from additional studies, update the report’s look and feel, and add text, images, or other branding elements to increase the report’s effectiveness. Click here to view support documentation on this feature. The first logic statement in logic will continue to work as it has in the past (blank). Now when you add a new statement in display logic or branch logic, it will pre-populate with the values from the previous statement which you can then easily adjust. This option will allow users to auto-number questions but skip any questions that have a custom tag (i.e. tags that don’t match Qualtrics’ default formats). Have you ever had to set up condition that was always false to hide an old question choice? Soon you will be able to apply a simple boolean condition to make logic always true or always false without messing around with random embedded data fields. Selecting “View Block in Survey Flow” will open up the Survey Flow Editor and navigate the user to the specified block. Users now have the ability to search and select any Embedded Data set in the Survey Flow from the Display Logic and Piped Text menus. Click here to view support documentation on this feature. Now when you enter the Survey Flow, you will be automatically navigated to the last Survey Flow element you were working on the last time the Survey Flow was accessed. As you navigate out of the Survey Flow, you are now navigated to the part of the page you were on before accessing the Survey Flow. As you scroll down on long surveys, the header will now stay at the top of the page leaving all menus available without having to scroll to the top of the page. Avoid Context Switch: Like any programming language, survey programming involves going back and forth between the survey logic and the survey editor. This switch often results in loss of context, wasting valuable time for the survey programmer. This waste is eliminated. Reuse: Like global variables in survey code programming, Embedded Data variables and the logic associated with it is called multiple times in the survey. Survey programmers can now easily view these from a drop down or with a simple click. Users can access publicly-accessible, elegant dashboards that report on the status of the quotas for a survey. We are launching a survey theme template. This is vetted by Qualtrics industry experts for high data quality and user engagement. Enhancements to our offline app includes several new features including the ability to manage panel members and launch surveys to specific members in addition to several reporting improvements. Set of outbound integrations with external SaaS Products within the Actions Platform: Zendesk, FreshDesk. Prescriptive Insights are like Key Drivers on steroids. The admin sets up a series of drivers of some outcome (like Overall Customer Satisfaction), and Prescriptive Insights outputs a personalized set of next steps for a dashboard user to take. To make sharing insights and updates even easier, Reports now has a Scheduled Email feature. Dynamically updated reports can be emailed automatically by any Report creator, and the attached reports always show the very latest data collected at the time the email was sent. Improved sentiment model trained with correction data and questions. You can now see response data from multiple EX project sources dynamically update in dashboards, without the need to manually refresh data. This change is focused on project sources that do not use organizational hierarchies. Enables selection of multiple EX projects as the source for dashboard widgets. The new EX dashboards have been completely redesigned to provide an improved user experience, including modern look and feel, cleaner visualizations, intuitive navigation and filtering, and new ways of exploring and understanding your results. Easily add additional metrics to a visualization to report on multiple sources or metrics within the same chart or table. Qualtrics Crosstabs tool will have an enhanced integration with Qualtrics reports, and access to all of the new data and analysis fields in the XM platform. Users of the CX dashboard can track new simple rolling metrics for average and NPS scores. 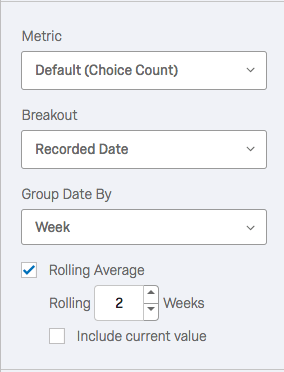 For example, a user can create a widget for tracking rolling NPS score for a 3-month window or create a widget for tracking rolling average for a 2-week window. Access all the unique features and workflows of CX dashboards easily from the XM Platform without having to navigate to separate Qualtrics tools. The Demographic Breakout Widget provides a new visualization in EX dashboards that helps easily identify high and low scoring groups broken out across any demographic dimension. Rolling Averages has been updated to pull in prior data into the first periods of the rolling window to improve the results by making each data point equivalent. For example, If you are calculating a rolling 3 month average on a year of data, previously the simple rolling average value first month, January, would only have been computed from data in January. Going Forward, it will be computed from data in November, December, and January, assuming that data exists. In addition, we soon plan to roll out a new function called Rolling Metrics which enables the rolling algorithm to be applied to any metric and weights every data point in that rolling metric equally. Both features will be released for a time, and then we plan to deprecate Rolling Averages. Cluster analysis allows users to segment their respondents by hidden patterns and relationships in their data. Selectively suppress visualizations in reports based on custom rules defined for each visualization. Hide charts and tables based on the number of records included or any metric-based filter criteria such as mean, max, min, or the sum of any numeric field. Completely redesigned dashboards for CX and EX. 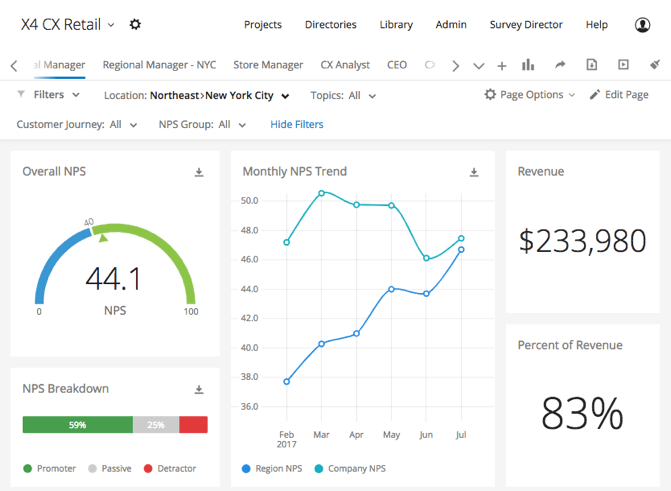 Qualtrics’ new dashboards strike the perfect balance of being powerful and flexible while maintaining elegance and simplicity. A new, more delightful and performant experience for combining multiple surveys, blended with Operational Data, into a single dataset for Customer Experience dashboards, analysis, and reporting. CX Dashboard users who create private sandbox dashboard pages can now email these pages out to themselves or others for even greater data sharing and transparency. Enhanced reporting and statistics on all communications: additional reporting fields, with support for customer-defined embedded data fields. To give Report creators even better control over table display, a Styles tab has been added to each table visualization. Now in addition to global control over table styles, Report creators can optionally override global styles for the table header and body per table visualization. A mobile app that can be used to view Dashboards for a user's CX or EX program. Report creators can now choose to display or suppress widgets based the number of responses included in the widget. This gives each report creator the ability to suppress widgets that have incomplete, confusing, or insignificant numbers of records so that every report viewer sees a clean and clear view of the data presented. Reports adds the ability to calculate rolling averages over their data. Rolling averages are a great way to smooth short-term fluctuations in data and see more general long term trends. Reports are storytelling and need to reflect the brand style of the data being presented. Reports now contains a full font library of 38 styles to give every report creator more flexibility than ever before to customize each report. Reports adds a new line and spacer widgets for more custom and flexible layouts. Now report creators can add blank space, horizontal, and vertical lines easily to their reports. To make Reports even easier to use, Qualtrics introduces the ability to create and save filters to re-use throughout Research Core. Rather than re-creating filters to switch between frequently used data views, save a filter once and use it throughout the platform - in Data Processing, Results, and now in Reports. For multi-select questions, many users prefer to report percent-based metrics based on the number of total selections made, some prefer to report based on the number of respondents who answered the question. Now Reports users can choose whichever denominator is best for any situation as well as show percentages alongside data points. This feature is also available as a report setting. A self-service tool that can be used to conduct Choice Based Conjoint analysis. 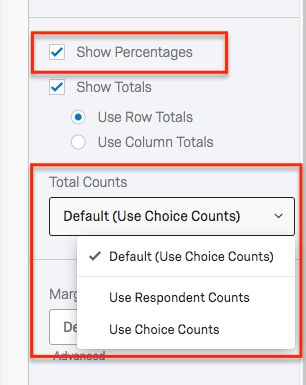 Since different data wants to be reported different ways, Reports users can now enable totals and choose between row or column totals in Data Tables. This feature is also available as a report setting. To make CX dashboards even easier to use, Qualtrics introduces the ability to save commonly used filters, so users can quickly see the data they are most interested in. 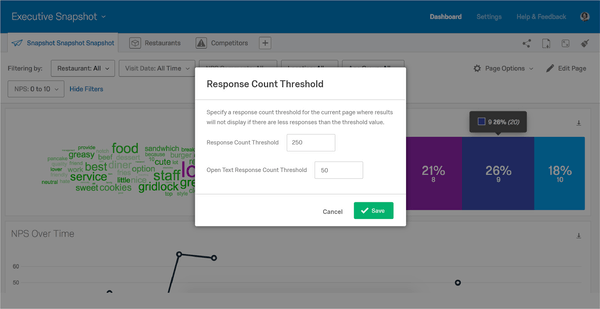 Qualtrics EX users can now analyze open text responses at scale by leveraging TextiQ. Topic tagging and sentiment analysis will allow users to see what their employees are saying and how they feel. TextiQ data can also be mapped into dashboards, to view TextiQ data alongside response data and share results out widely to managers. Export EX dashboard widgets for further analysis and reporting. The following widgets are now supported for export via CSV or TSV files: Gauge Chart, Pie Chart, Simple Chart, Number Chart, Simple Table, and Key Driver - Plot. 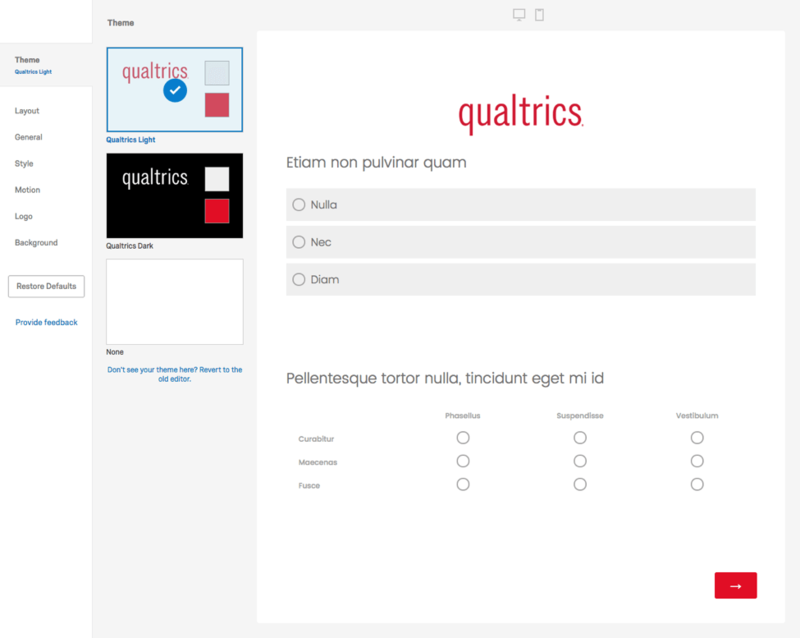 The next generation of the Qualtrics Text iQ tool is now available in Preview for all Text iQ users. Users can opt in and out of the preview experience at will, and new features will be added until the experience is complete. Features in the initial preview include and updated look and feel in the comment list for easier reading, the first release of topic hierarchies in Text iQ, and the ability to add additional fields to the comment list for a richer at-a-glance record view. 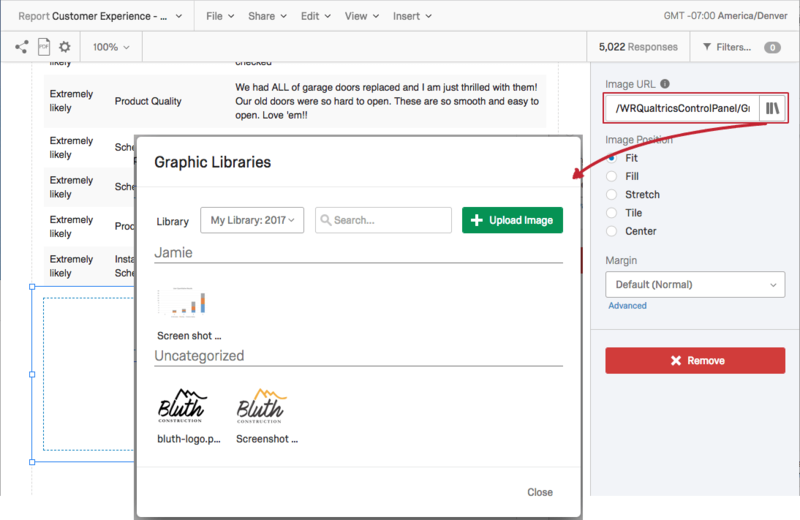 Images can now be added from a user’s personal or brand-level library to any report. Click here to learn more about how to use this feature. Piped Text reduces repeatable reporting tasks such as inserting question text or total number of respondents directly from the source project. Instead of inserting elements that otherwise need to be re-inserted or updated every reporting cycle into a new report, the report creator can easily insert a variable to represent the data then use the variable in place of the element in the report. Click here to learn more about how to use this feature. These improvements to Text Tools responsiveness are now available to Basic Text clients as well as all Text iQ clients. In the past, topic changes were made and applied each time a single topic was updated, resulting in frustrating delays between completing one change and starting another. Now Text iQ includes a new layer between the Text iQ UI and the phase where responses are updated with topic changes so that a large number of changes can be immediately made in the Text UI and then applied as one big batch to responses. Everyone exporting a Results Report to PDF to print, email, or share it now has a dramatically improved export experience. PDF exports are now cleaner and more attractive, and generating those reports in Qualtrics is more reliable than ever before. 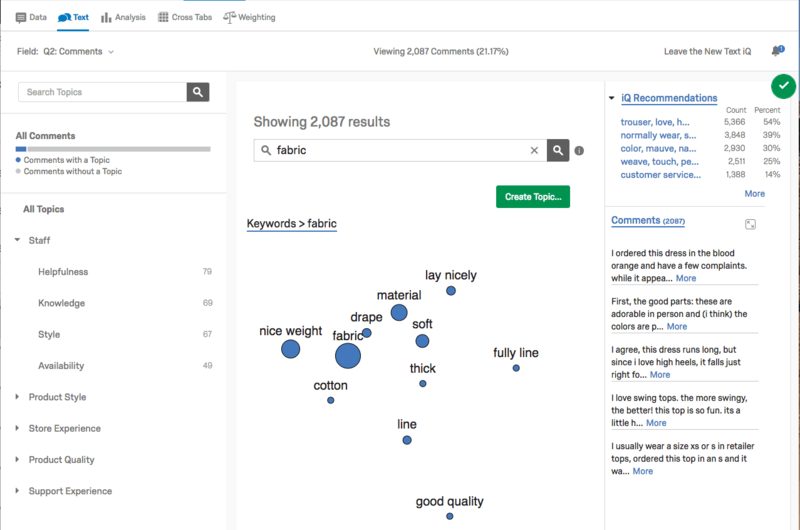 Qualtrics is committed to always expanding and improving every part of Text iQ, from the visualizations to the topic model, to the accuracy and reliability of Sentiment Analysis. Today, Qualtrics is proud to announce a major update to its Sentiment Analysis engine. We have added a new neural network-based classifier to the lexicon-based classifier already in Text iQ. Text iQ automatically chooses the classifier that gives the highest confidence sentiment score, resulting in an accuracy increase of up to 23%. Qualtrics Text iQ now performs better than any benchmarked competitor in the sentiment analysis of Qualtrics-collected English-language. 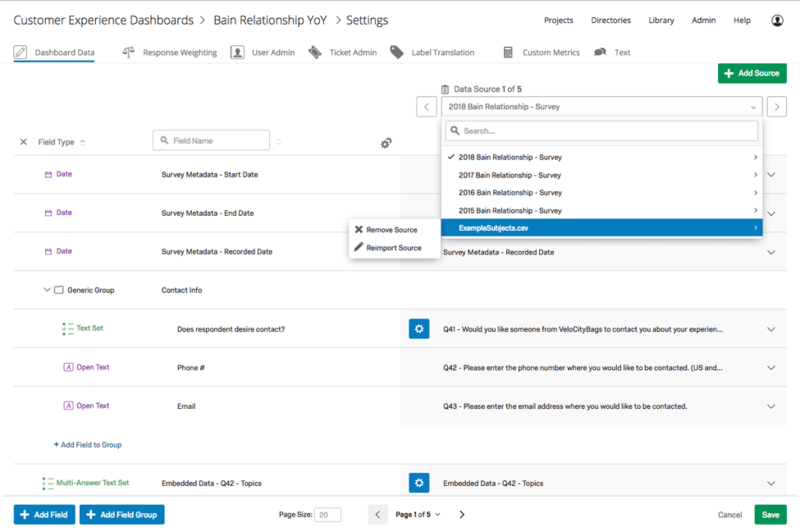 Qualtrics now enables dynamic filters on dashboards. Users rarely use a single filter on their data and in the past users had no idea what filter options would result in no data due to other filters applied on the page. Now when using filters, there is clear demarcation in the options that do have data available, vs. those that do not. Analyses of large datasets can take a long time. Stats iQ now automatically samples large datasets on the fly to reduce analysis weight times. For example, an analysis in a dataset of 1M rows might be sampled down to only 50K rows. It will complete much faster, and in the vast majority of cases the statistical finding will be the same as if the full dataset had been used. Users will have the ability to change the sample size or turn off sampling entirely in a given card or across the entire dataset. Learn more in the sampling section of our support pages. To make reporting on sentiment analysis even easier and more flexible, Qualtrics adds two new numeric fields for Sentiment Analysis that can be acted and reported on in Results, Reports, and Dashboards. This allows users of Qualtrics reporting to more easily report on certain metrics, such as mean and distribution, driver/correlation analysis, top/bottom box, and other numeric calculations. 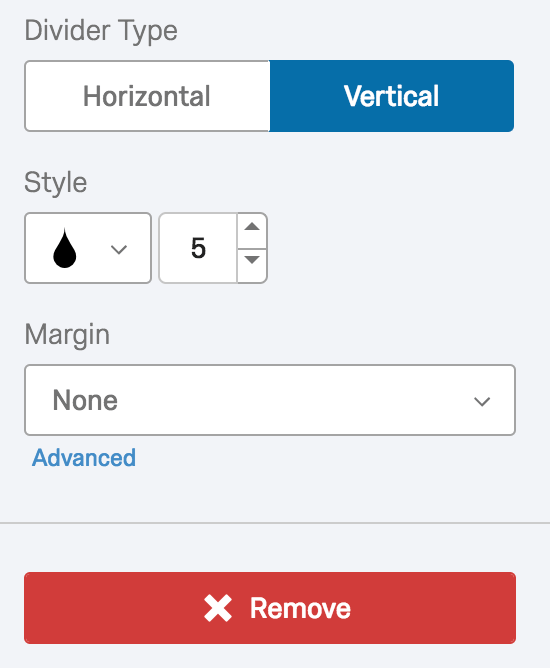 Users now have more choices for Qualtrics response weighting. Users can choose dynamic weights, which are calculated on-the-fly to make sure that the weights meet the desired proportions (legacy functionality) or specify a static weighting value for each population they want to weight. This new option, Static Weighting, will not be recalculated by Qualtrics. For more information on response weighting, see this help article. If Response Weighting has been configured for a project in the Data & Analysis tools, reports will now optionally show weighted metrics. Use Settings to turn weighting off or on for the entire report, and add or remove weighting from individual visualizations in that visualizations’ options. Click here to view support documentation on this feature. For reports that benefit from public sharing but need a little extra protection, Reports now offers optional passcode protection on public report links. Specify the unique passcode for a shared report and Qualtrics will require the viewer to enter the passcode before they can view that public report. Click here to view support documentation on this feature. Report creators can now save and apply their own personal report style defaults to every report they create. Rather than applying default settings per report, the report creator’s settings will be automatically applied to each report created, and can then be customized per report or per visualization. Default setting include color palettes, decimal precision, spacing preferences, default visualizations, and more. Click here to view support documentation on this feature. Now with a single click you can create a copy of your entire dashboard within your Employee Engagement projects. Previously users had no way to copy dashboards within an existing project and were required to build unique dashboards. This new feature empowers you to simply navigate to the dashboard you would like to duplicate and choose the “Copy dashboard” option from the dashboard menu. By clicking this button, Qualtrics will create an exact copy of that dashboard with all of the same pages, layouts, and content. Click here to view support documentation on this feature. Number Charts allow comparing results to a previous time period so users can quickly determine if performance is declining or improving. It respects the page page filters as well so users can explore different time periods. Click here to view support documentation on this feature. 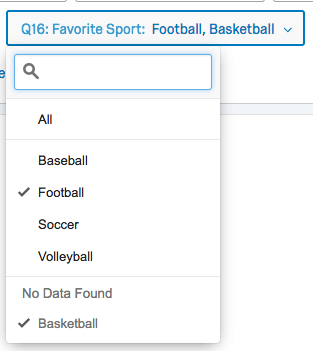 Qualtrics now allows uploading external data directly through a .csv in the fieldset. So when users need to bring in external data (e.g. benchmarks) to supplement data collected in the survey, it’s now easier than ever. No need to create a fake survey to import the data, just import it to the fieldset directly. Click here to view support documentation on this feature. These improvements to Text iQ responsiveness help all Text iQ clients but are especially designed to make the UI for Text iQ snappier for analyzing 100k-10MM responses. In the past, topic changes were made and applied each time a single topic was updated, resulting in frustrating delays of moments up to hours between edits for very large response sets. 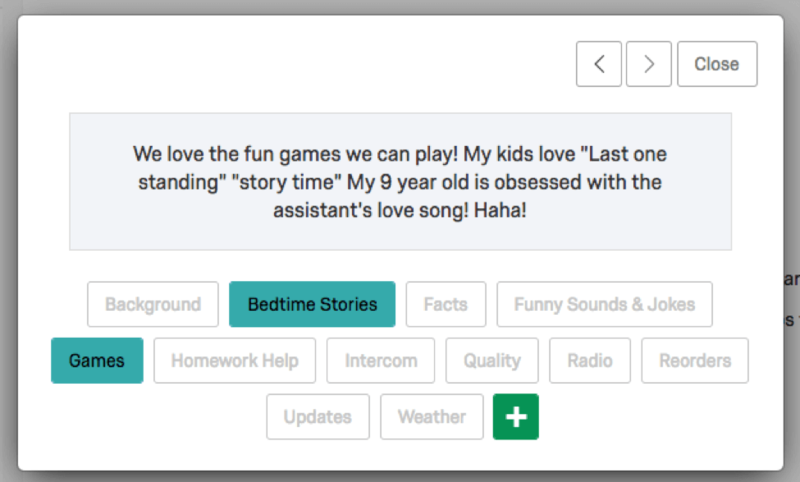 Now Text iQ includes a new layer between the Text iQ UI and the phase where responses are updated with topic changes so that a large number of changes can be immediately made in the Text UI and then applied as one big batch to responses. For even more control over the scope of every text analysis topic, all Text iQ users will be able to use "near", search phrases, and exact search phrases in topic queries. In addition to the existing “and”, “or”, and “not” operators in queries, the order and proximity of text between operators will be considered. In addition, these order and proximity restrictions can be softened using the near operator, “~#”, where # is a number between 0 and 99. Furthermore, results can be narrowed by exact match searches using double quotes. All new operators can be combined with the existing query options. Click here to view support documentation on this feature. This new importer is a more flexible, responsive, intuitive way to import responses into Qualtrics surveys than previous versions. With Employee Engagement and Pulse project types integrated into the XM platform, EE and Pulse users gain access to a newly updated user interface and various feature upgrades including survey library access, expanded survey options, and the ability to localize admin views and dashboards into any language. The next generation of data visualization and insight sharing. Editors can control report layouts, tweak individual visualizations, add data from additional studies, update the report’s look and feel, and add text, images, or other branding elements to increase the report’s effectiveness. 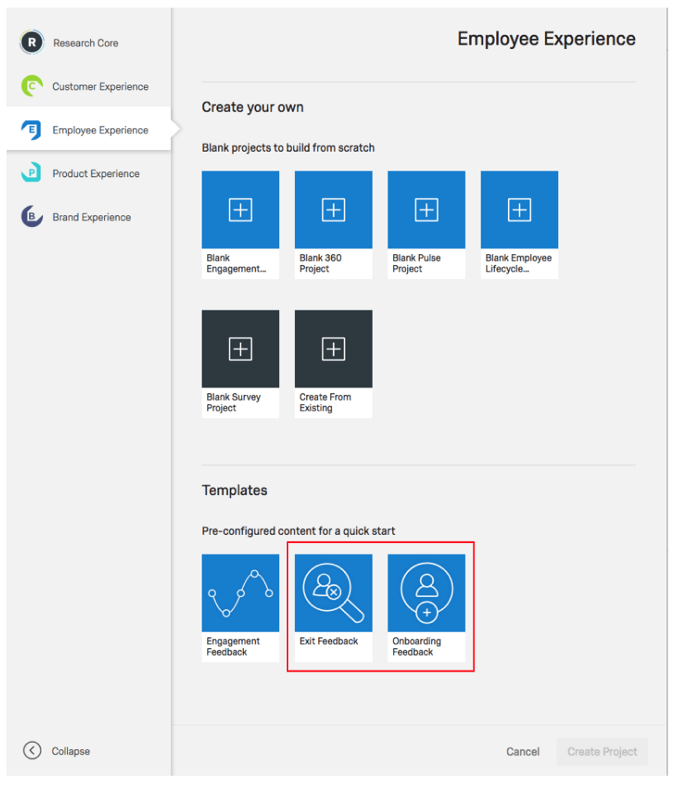 Qualtrics integration (add-on, paid) with Microsoft Dynamics CRM - Allows Qualtrics customers to sync Dynamics object data (O-data) with Experience data (X-data); Brings X+O data together through an events-driven interface that works seamlessly between Qualtrics Actions platform and Dynamics by sending events to MS Dynamics. 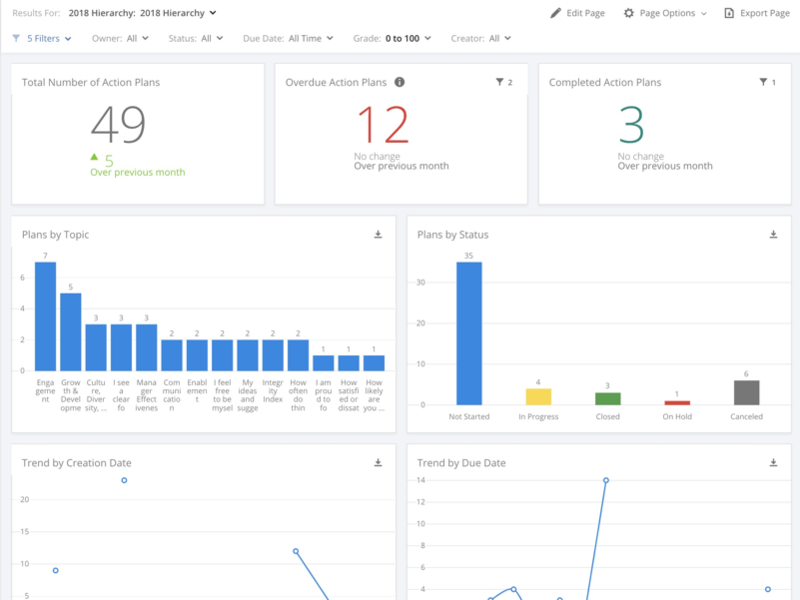 Qualtrics Customer Experience Management now supports enhanced action planning and tracking for longer-term, cross-team initiatives, all within the XM Platform. Leaders are now able to report on how action plans are progressing across the organizaion. Administrators can create dashboard pages and widgets using action plan data, and download this data for further analysis and reporting. This feature is only available in Employee Engagement project types. Update to the user experience for the email composer in ticketing that allows users to view and interact with ticket information while composing the email. Sends automated email reminders for tickets based on conditions. Use templates to easily setup ticket actions. 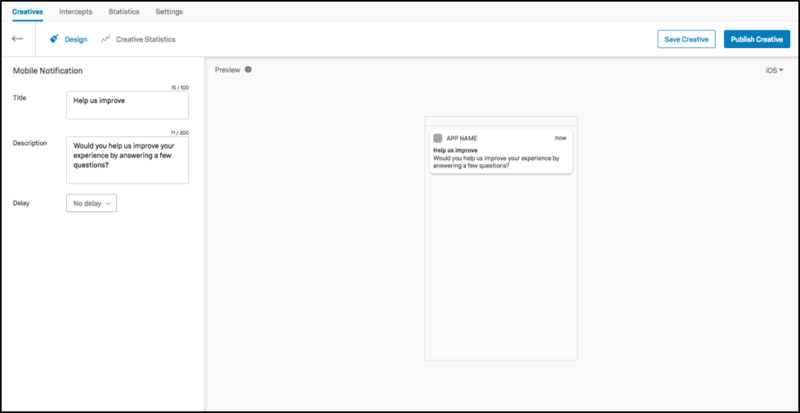 A new task type in the actions page that allows a user to configure a survey distribution to a single recipient based on the user selected event/trigger criteria. Qualtrics user can set up an event trigger in Actions Page based on a ticketing event such as status change that meets a certain condition to perform a task (eg. send email, distribute survey). For brands with 2-way email enabled: This functionality allows for ticket statuses to automatically be changed when an inbound email is received. This is useful for organizations that want to ensure tickets show up in an “active status” view when a ticket requires a response. With Highlight Summaries, Qualtrics automatically shows ticketing users why the ticket is important to them and gives them critical information upfront. The summary provides users with the key information they need to know about why they are closing the loop with the customer. 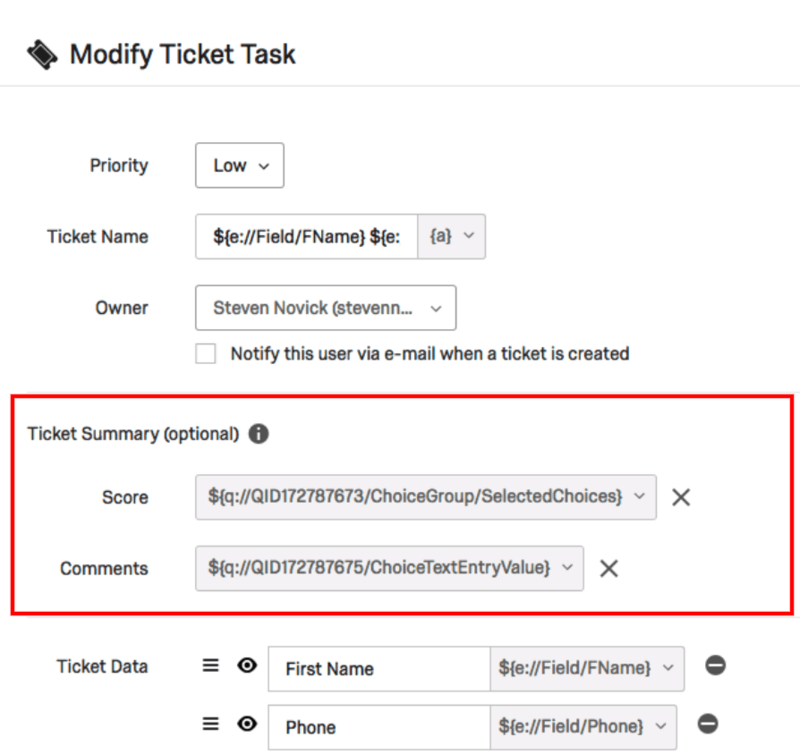 When creating a ticket task, there is now an optional section to pipe in a score and open text comment for a banner at the top tickets. Give brands more granular control of when email notifications are sent to their users. 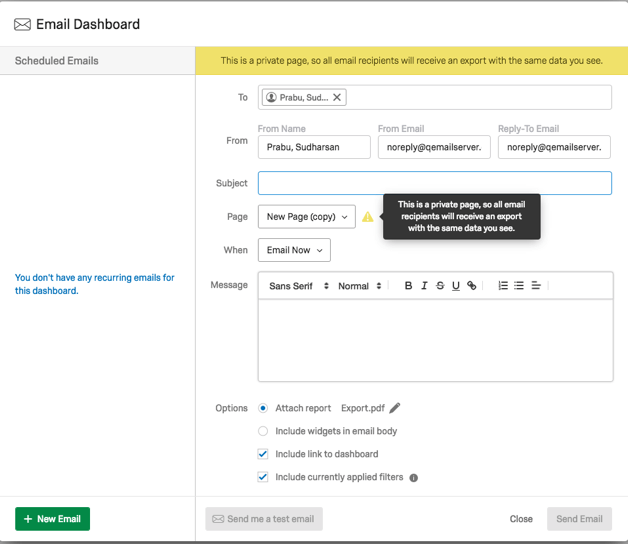 Brand admins now have the ability to turn off all standard email notifications for ticket creation and reassignment. 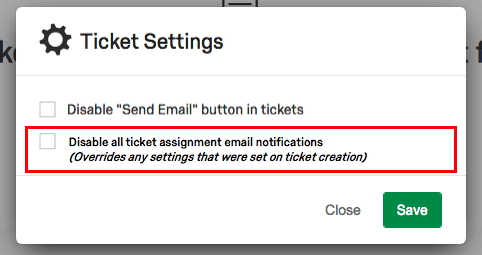 This allows for custom email notifications to be created for ticket creation and reassignment when using the “Email Task” in the same action as the ticket creation. The Follow Up mobile app now supports closing the loop via email with customers. When emails are sent through the app, the email history is tracked and attached to the activity history. The app also now supports the 2-way email functionality if enabled for the brand. Recode values are now supported in Ticket Reporting fieldsets.The functionality is the same as the recode editors for CX dashboards - more information about this can be found on this support page. Ticket Forwarding allows individual users to enable automatic ticket reassignment to another user when they are out of the office. This enables customers with time-sensitive closed-loop processes to ensure tickets do not get assigned to someone who may be out of the office, but rather get reassigned to someone available to follow up with customers. Individual users can enable forwarding by selecting “Ticket Forwarding” in the “Tools” menu on the ticketing application. The user will then see a bar at the top of their ticketing page indicating that their tickets are being sent to another user. By default, this feature is enabled for brands. Brand Admins can turn off the ability for their users to use this feature by selecting the option “Disabled Ticket Forwarding for Users” in the “Ticket Settings” menu under “Tools”. Bulk user management for CX dashboards. Will add user directory in CX project that will allow bulk import and export of users and user metadata and supports search/filtering of users based on metadata. Will also include automatic role assignment and dashboard permissions management. 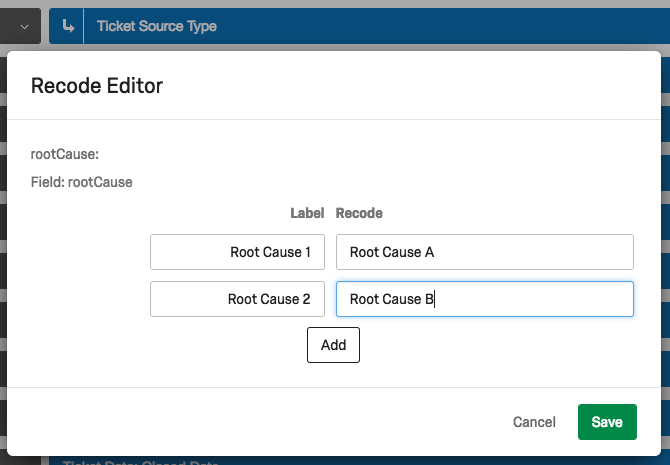 Support for the recode editor for ticket reporting fieldsets. Allows users to automatically reassign tickets that are assigned to them to another user when they are not available to take new tickets. Creates a queue of tickets for large teams to use to allow assignment based on when a ticket operator is ready to work on a ticket. The Qualtrics mobile app for Closed-Loop Follow-Up now supports SSO so users that are part of an enterprise license using single sign-on can now use the app. The app is available via the app store. While some customers use email to close the loop, others customers prefer to use phone calls only. 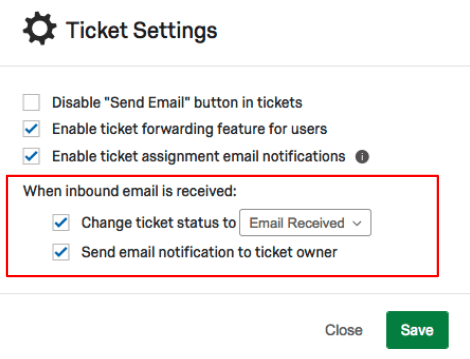 Using the new setting in Closed Loop Follow-Up, brand admins can remove the “Send Email” button from their tickets, to customize the workflows to their organization’s needs. Qualtrics now allows customers to track entire email conversations through the ticketing product. Previously, users could send an initial email from the ticketing app, however, responses would come back to their regular email inbox. With this feature, email responses will go straight into the ticket so that the entire conversation is tracked in the ticket activity, including any attachments that the customer added to the email. Click here to view support documentation on this feature. Any Qualtrics User can now use the new Email task in Actions Page to set up event-driven Emails. A new Response Export API that exposes the increased scale, new fields, and faster speed of the new export services available in the UI to integrations and other API use cases. Salesforce Integration now allows users to enter embedded data directly instead of using the piped text format. 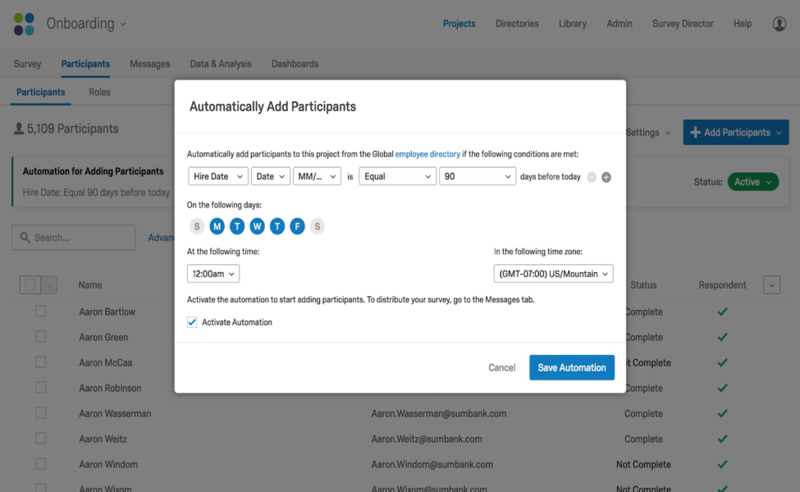 Salesforce Integration triggers can now handle anonymous link distributions. All features of Qualtrics Sentiment analysis are now available in 9 additional languages. Within Text iQ and all across the XM Platform, use Sentiment Analysis to understand, analyze, and take action on how respondents are feeling. This feature will allow Stats iQ to use the results of analysis in Text iQ. For example, a user might note that many customers discuss "responsiveness" in their open-ended comments. Stats iQ will now take in that theme as a new variable, allowing the user to see how that relates to a host of other variables. Text Analysis is a key phase in CX program analysis - and now it's easier than ever to navigate between your dashboards and Text iQ. Default to Selected Question: After choosing a field to analyze, that question will be the default upon returning to Text iQ. Feature description: For ultimate precision control over topics, the Text iQ Preview experience now supports manual topic addition and removal. Use the full topic grid or sweeper experience in edit mode to manually add or remove any topic from any comment. It’s now even easier to share Text iQ topic definitions between projects using Topic Export and Import. In the New Text iQ Preview, topic definitions can be exported from any field and then imported into any other field as a convenient starting point for analysis or an easy way to keep topic sets aligned across projects. EX users now have access to Text iQ, Qualtrics’ advanced text and sentiment analytics features. Text iQ automatically uncovers open-text insights and identifies trending topics, allowing users to easily filter, analyze and share deep insights within their data. Relative Weights Analysis gives a clear sense of which drivers have the greatest impact on an output, even if the input variables are highly correlated. The results of a Relative Weights Analysis will be added to the Stats iQ regression output. Currently in Stats iQ anyone with access to the project being analyzed can see any workspaces created. For large companies, this creates a too-long list of workspaces to choose from (and potentially interfere with accidentally). Workspaces will now be default private and only shared to collaborators when explicitly changed to shared. Group topics together into hierarchies and report on each topic's sentiment in Text iQ and specialized reporting and dashboard visualizations. This feature will allow Stats iQ to analyze very large datasets, even those that have tens of millions of rows. Very large datasets will be sampled down to more manageable numbers on the fly. Users will be able to decide whether they'd like to sample down to anywhere from 10,000 rows to 1,000,000. EX users now have access to Stats iQ, Qualtrics’ built-in statistical analysis tool. StatsiQ automatically runs the right statistical tests and visualizations, translating results into simple language any can put into action. Additionally, Stats iQ easily produces predictive models so EX users can identify actions to prevent and shape the employee experience proactively. Improvements to Text iQ responsiveness that will help all Text clients but are especially designed to make the UI for Text iQ snappier for analyzing 100k-10MM text fields. Storage of all Customer Data Caches in an S3-based Data Lake. EX project admins now have a self service interface to export and import translation content to localize their dashboards. Closed loop workflows are the latest addition to Qualtrics’ closed loop platform which helps activate your organization to take action on the things that matter most to your customers. The functionality included in closed loop workflows helps even the largest of enterprise organizations ensure that the right people are taking action and closing the loop with their customers in a timely and efficient manner with a fully automated system. The data mapper, which is used to map data into the EX dashboards, is getting a fresh look-and-feel. Along with a revamped interface, we will now be supporting the mapping of “Allow Text Entry” boxes, comment fields being marked sensitive, and a new multi-map UI that allows you to view a field’s mapping across all sources. For the Survey Creator, Compliance Assist provides automatic detection and warnings on questions that may potentially collect sensitive information. For the respondents, Compliance Assist provides automatic detection of PII in their responses and real-time warnings to prevent them from accidentally submitting PII. For the data analyst who is analyzing the responses, Compliance Assist is able to automatically detect and flag responses that have PII or other sensitive information and redact the sensitive words and phrases. See below how an organization can easily set up their account to track and prevent sensitive information from being collected. You can find more details in our support document here. In the Admin section, the Brand Admin has complete control over what topics, keywords, and formats to check for that would constitute Personally Identifiable Information. Survey Creators are automatically warned if they ask questions considered sensitive by their organization. The Respondent is warned in real time if they enter information that is considered sensitive. The Data Analyst gets notified in real time if a response contains sensitive information and the type of sensitive information. It will also automatically redact the information if the Brand Admin has configured those topics for auto-redaction. The updated Profile & Timeline View enables users to see a consolidated view of a contact's profile, as well as all historical events for the contact visualized on a timeline. 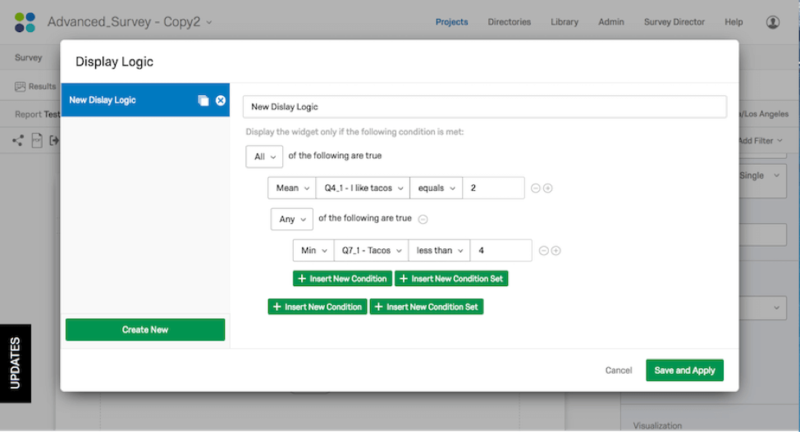 EX project creators can now choose to start from an Employee Engagement template that will give them a preconfigured survey, dashboards and messaging for easier program setup. EX users can now use SFTP import automation to automatically bring in new people data into the Employee Directory. XM Certified Solutions for Product Research. With Multiple Directories, organizations can maintain multiple fully independent contact directories. This gives large enterprises the ability to control access from business unit to business unit. EX Dashboards will have a new "Questions List" widget. EX Dashboards can now include Heatmap visualizations, which provide an efficient way to quickly identify high points and low points across the org or demographic groups. A convenient way to delete personal data of an individual via UI or public API. 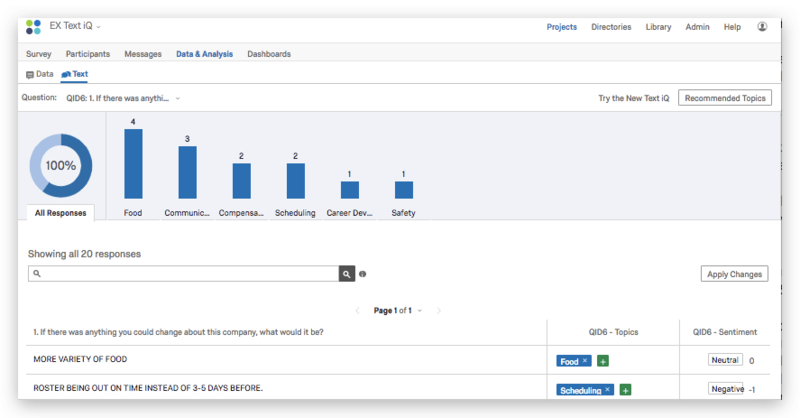 This feature enables better organization of Survey Logic. A set of public API endpoints that allow administrators to retrieve details about activities recorded in the Audit Log. A single login service used for all elements of the Experience Management platform, so that login experience is the same and no user has to log in multiple times for multiple XM Products. The Federal Risk and Authorization Management Program (FedRAMP) is a government-wide program that provides a standardized approach to security assessment, authorization, and continuous monitoring for cloud products and services. FedRAMP is commonly recognized as one of the most stringent security accreditations globally. EX Projects now have an improved security model covering dashboards visible to users / roles. 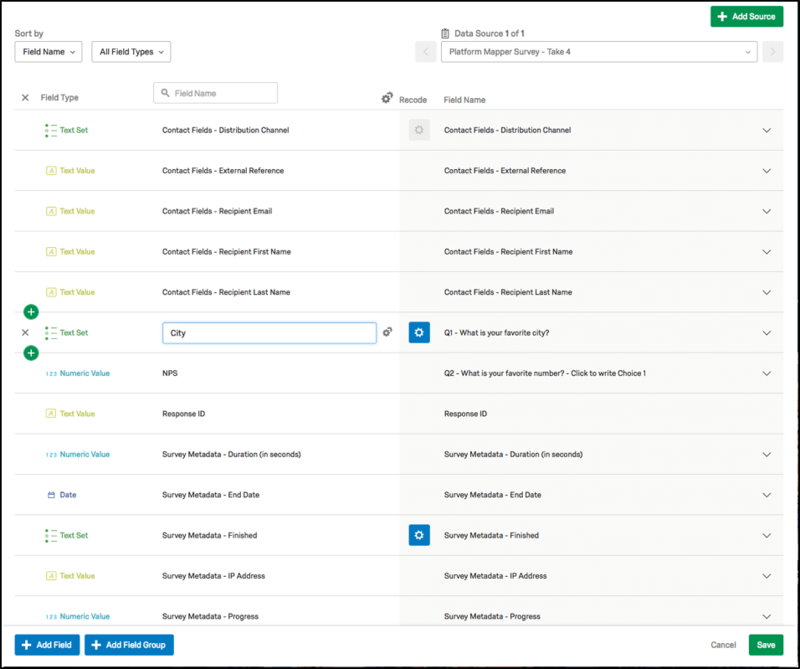 The Qualtrics 360 product is now completely integrated into the XM Platform. With the integration users can run their 360 programs along with all of the other Qualtrics solutions out of a single account. The entire interface has also been redesigned to provide a beautiful and delightful user experience throughout. For more details on the following improvements with the XM Platform integration please see the What’s New in 360 in XM page. Click here to view support documentation on this feature. When adding users to CX dashboards or managing roles, Qualtrics now allows searching through a list of roles to make it easy to find the role you are looking for. The list is also sorted alphabetically. Click here to view support documentation on this feature. A Qualtrics Brand Admin can build a script to access the Public API with a secure token which expires and can be refreshed programmatically - as opposed to the current X-API-Token which doesn't get refreshed. Qualtrics has added improved accessibility support for website feedback creatives. Visitors to websites with website feedback deployed, now have the ability to use keyboard-only navigation to interact with elements of a creative that is displayed when an intercept is triggered. For example, on a PopOver creative, users can now use the Tab key to move between elements and use the Enter key to “click” elements of a creative (e.g., Submit Button, Cancel Button). Beyond these updates, additional accessibility functionality can be achieved by following the HTML code samples provided here. 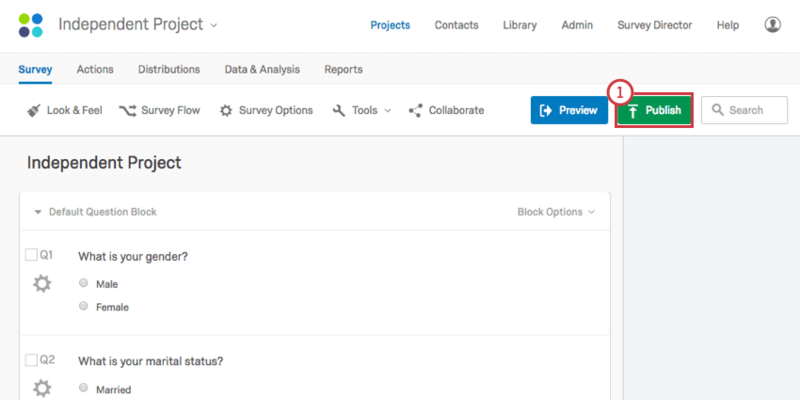 The Qualtrics Experience Management platform is now reflected in the projects list and create project workflows. Users can now see all their projects from every XM category clearly marked in one location. Most of the functionality on the projects list remains familiar, but with a refreshed look and feel. Creating a project now shows all of the projects users have access to by XM category. These include options to start from scratch (i.e., “blank” projects) or utilize a project template that provides a valuable starting point with a project ready for data collection. These templates can save users dozens of hours of setup time while providing expert solutions for common research use cases. V3 Get Contacts Import should return contact information that failed to import after status = complete. API create contact character limit (XM Platform Contacts) is no longer 6000 characters. Public API v3.11.0 was released on October 03, 2017. With this release, users can now get contact email and response history at a directory and mailing list level. A timezone parameter has been added to the create and update user API. Brand permission data will now be obtained from Authorization Service. Additionally, the WebService task is now generally available. For increased security, users and administrators can choose to use multi-factor authentication for Qualtrics logins. 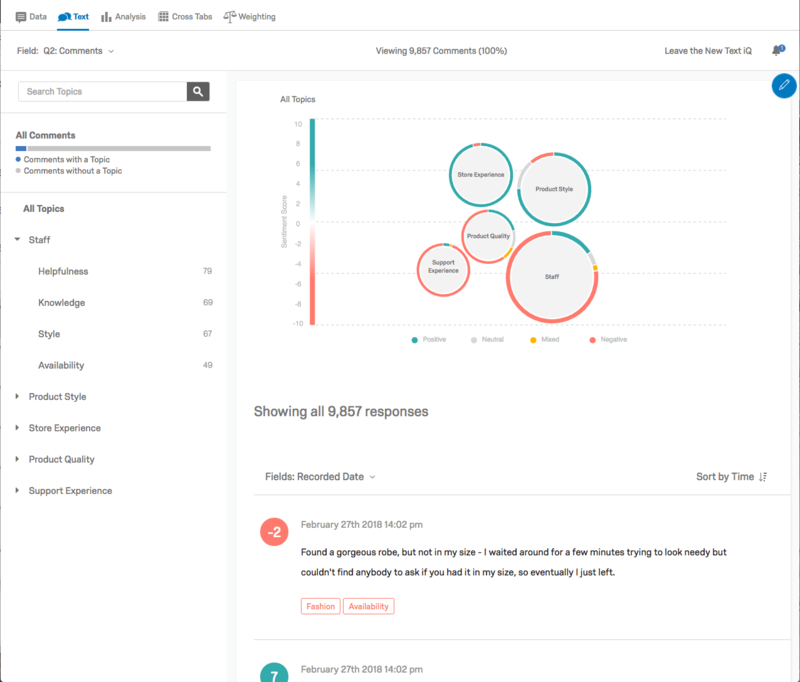 A new, more delightful and performant experience for combining multiple surveys into a single dataset for Employee Engagement dashboards, analysis, and reporting. CX dashboards will provide more intuitive views of distribution statistics and filters when viewing response rates and other statistics over a selected period of time for a survey. As an XM Directory user, I can use the respondent funnel in Vocalize to calculate and visualize CX program metrics such as contact sample rate, email open rate, and survey response rate. I can also configure which embedded data fields are used to slice-and-dice the data. EX now supports participant Unique ID that is separate from email address, allowing flexibility in email addresses. Adding Brand Lift projects to the Brand Experience offering, it's now possible to create a dashboard-based project that will measure the effectiveness of an ad campaign around your brand with just a few clicks. Automation users can configure an automation to distribute surveys via SMS. Leverage mobile app notifications to deliver feedback survey invites in-app. Enables intercepting your app visitors even when the app is not in the foreground (e.g., for app exit surveys). Prescriptive Insights are like Key Drivers on steroids. The admin sets up a series of drivers of some outcome (like Overall Engagement), and Prescriptive Insights outputs a personalized set of next steps for a dashboard user to take. The convenient, platform-supported way to analyze any data (even data not collected on Qualtrics) easily with the fabulous Qualtrics Data and Analysis tools. Ability to makes changes to a dashboard, and only publish when ready. Ability to give users admin access to ticketing without making them a brand admin. This builds towards a generic event-trigger and API interface that will allow building IFTTT integrations with external SaaS products. The Custom Event and API enable arbitrary external software to start workflows via HTTP request. Without the Custom Event, users are limited to a small set of purpose-built event handlers by Qualtrics eg: Survey Response Event, Salesforce Workflow Rule, Sentiment/Topic Event. 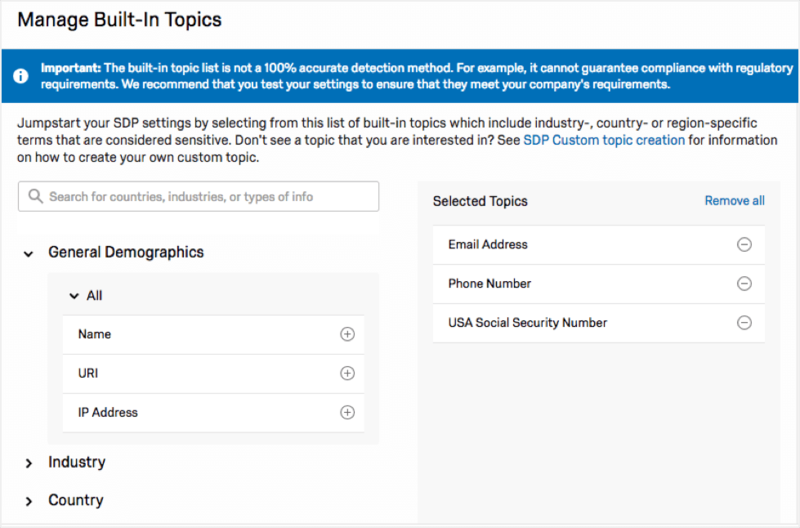 Qualtrics user can set up an event trigger in Actions Page based on a Topic or Sentiment event update made to a survey response. The Google Sheets integration for data exports extends transparency and accessibility of all data. In addition to CSV, TSV, SPSS, and XML exports, Qualtrics will export directly to Google Sheets. Analyze, report, and filter on Next-Gen Text iQ visualizations, topic-level sentiment, topic hierarchies, and other Text iQ data side-by-side with any other fields in a CX Dashboard. This work will allow users who have both Stats iQ and CX dashboard to analyze a dashboard-specific dataset directly instead of exporting it and then reimporting it into Stats iQ. ExpertReview Response Quality V1 helps identify poor quality including bots, cheaters, duplicates, PII and speeders. 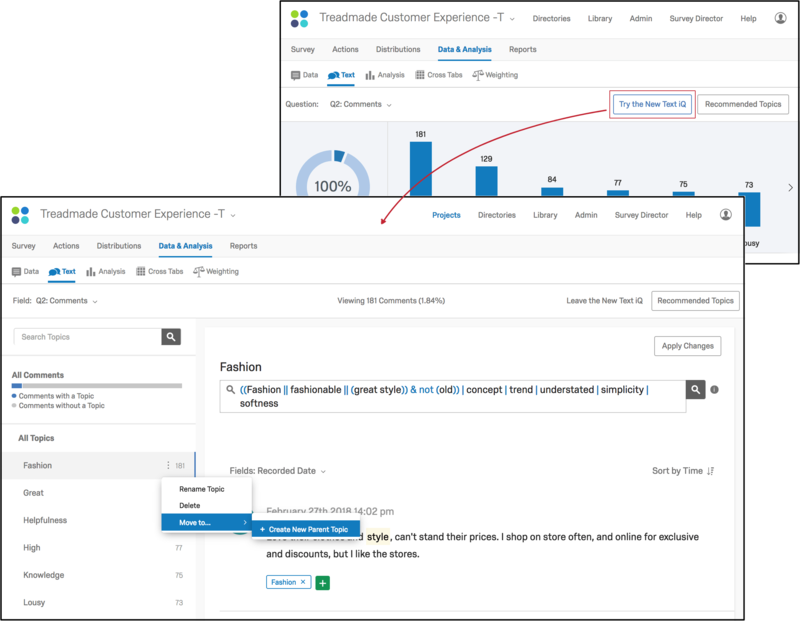 Qualtrics now supports Brand Tracker projects as part of Brand Experience. This new project makes it easier than ever to create a Brand Tracker project, including dashboards, historical trends, common brand analysis tools, competitive benchmarks, and social data integration. When importing participants from the global directory to Employee Engagement projects, there are new options to only import a filtered subset or a random sample of the participants from the global directory. This improves the reliabiliy of importing large, complex files into the Qualtrics systems (people, org hieararchy, roles, permissions). Migration of 85% of Qualtrics fieldsets to use AE for all reporting. This means that all cache data will be stored in AE, and deprecated from RE. Analytics Engine becomes the default real-time reporting engine for the data platform. 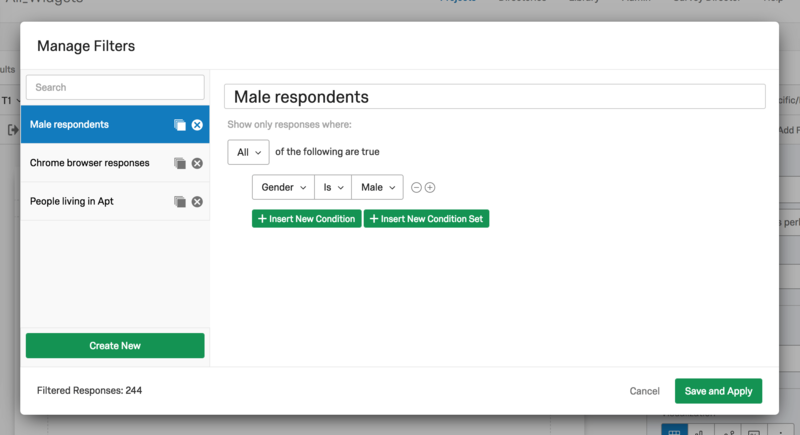 Users will be able to create a supplemental data source that is used to feed into answer options, text values in their survey. The Auto Complete feature is taking a very common user experience and applying to the context of survey taking. Auto-complete is also referred to as text search, incremental search, inline search, instant search and several other variants. The most simple explanation is that when a user types one or more characters into a text entry input, a list (commonly a set) of options is presented as discrete choices that can be selected. The selection of a choice(s) can then trigger other user flows like automatic redirection of the experience or simply a reflection of a state that may be persisted to a more durable persistence layer (like a survey response on page submission). In our use case it simply binds the choice value to the question state which gets persisted when the page is submitted. Users can enable certain data like Questions and Embedded Data as Restricted and thus inaccessible for employees without the right permissions. The Survey editor will support a master list of choices. Any choice based question can reference the choices from this master list. This feature is very helpful for studies that ask for feedback on a large bank of 100+ choices. Connect to review sources and analyze trends alongside your CX data. Close the loop by linking directly to the specific review on the specific site. Solicit reviews by routing feedback to a review site. As an Experience Manager, I want to connect my sources of X and O Data so that I can create a seamless view of the experience of my customer, user, employee, citizen, student - whoever my customer is! To keep CX dashboards as snappy as possible, while still allowing on-the-fly changes to datasets and relationships, Qualtrics introduces the ability to create multiple versions of datasets that can be edited and published to dashboards independently. 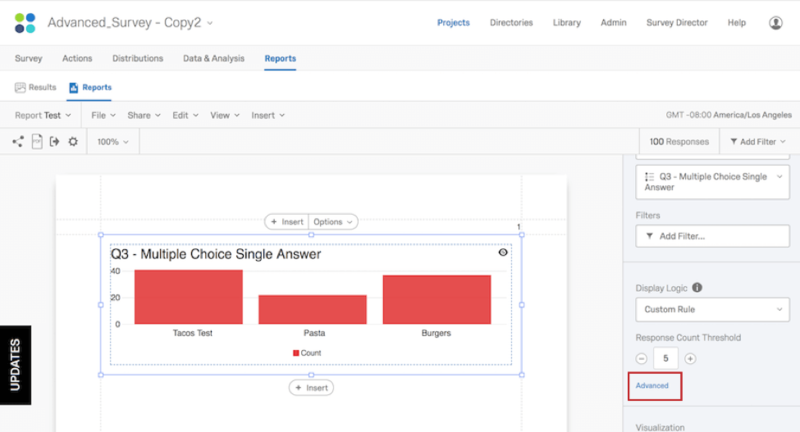 360 Projects now get the scalability, beauty, and layout options of the new Qualtrics Reports platform. EX dashboard filters will dynamically group together filter or breakout values that would fall below the anonymity threshold. This allows these value to be viewed as a larger group and prevents use of filters or breakouts to try to back calculate data that was not shown directly. Enables Ticketing users to create and save email templates to use when closing the loop with customers in the ticketing application. As an XM Directory Automations user, I can clearly see pending files that will be processed the next time my automation runs. Also, if an automation fails, I can easily re-run it. A generic event-trigger API interface that will allow building new workflows through the Actions page. Text iQ powers real-time survey flows based on comment sentiment, topics mentioned, and the sentiment of topics mentioned. As a CX program administrator, I can define alerts on XM Directory Respondent Funnel metrics (files imported, contacts imported, emails sent, emails bounced, email open rate, survey response rate, etc). Localizing an EX dashboard required two different methods (one for EX widgets, one for shared widgets). This work allows a consistent method of localizing widgets across an EX dashboard. Question Blocks in the Library to post feedback/reviews to social media using Qualtrics surveys. The Themes Template Engine ensures that every Qualtrics theme is attractive and ready to collect high-quality data. Combine multiple surveys, blended with Operational Data, into a single dataset for Research Core analysis and reporting. Rather than being required to view every loop separately, combine all loops into a summary, matrix-table style for easy analysis and reporting. Role-based access control to individual tickets based on organization hierarchy attributes. Stats iQ will now enable users to create a standard Top Box, such that all analyses will run on both the original variable and the Top Box version of the variable. NPS variables have a dual nature: they're both numeric (0 - 10) and categorical (Detractor/Neutral/Promoter). Right now Stats iQ treats NPS variables like any other numeric variable. 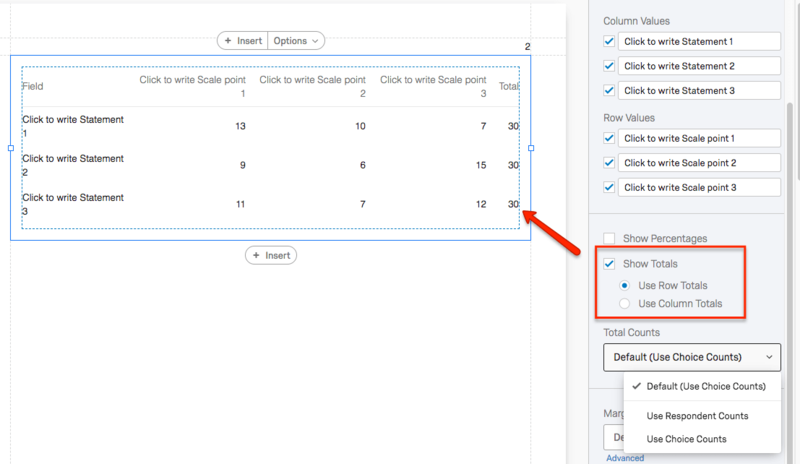 This feature will (1) show analysis results for both natures of the variable and (2) calculate NPS scores on the fly (Promoter% - Detractor%) instead of requiring a variable to be created. Many survey questions have response options like "1 - Happy", "2 - Okay", and "3 - Sad". These variables have both a numeric and a categorical nature - users might want to know the average score, and users might want to know what proportion of respondents answered "Happy". Stats iQ does not allow users to analyze both natures of the variable at one time. This feature will enable this, solving the top user complaint about Stats iQ. iQ Directory users can import contacts from survey responses collected. DataMapper will support additional Joins.